Multiple stakes winner Corona B Gone will had a strong field at Portland Meadows Sunday in the $11,0000 Mount Hood Handicap (not black type) for Quarter Horses at 400 yards. PORTLAND, OR—FEBRUARY 1, 2019—On Sunday Portland Meadows will have a special early post time of 11:10 am for the ten race card. 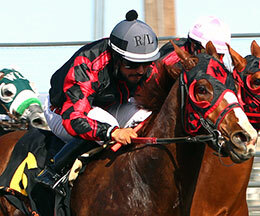 The featured event will be the $11,0000 Mount Hood Handicap (not black type) for Quarter Horses at 400 yards. The Mount Hood Handicap has lured a field of eight to dash the distance as Corona B Gone (2-1) looms the morning-line favorite after winning the Portland Meadows Championship Bonus Challenge last December worth $17,000. Trainer Hector Magallanes will saddle the 4-year-old son of multiple stakes sire Favorite Cartel for owner Ruben Magallanes. Bred in Oregon, by Michael and Shannon McKay, the sorrel gelding has compiled an (18) 6-1-5 record and banked $63,174. The multiple stakes winner is from the Shazoom mare Go Girl Gone. Cm One Ina Bluemoon has been installed as second choice at 7-2. Conditioned by trainer Nick Lowe, the 4-year-old son of Ivory James entered the Mount Hood off a two-race win streak after running third to Corona B Gone in the Portland Meadows Championship Bonus Challenge. Lowe co-owns the bay gelding out of Cool Blue Corona by Jess Louisiana Blue, with his breeder Randy Dickerson. Jockey Alex Anaya has been tapped to ride. The Mount Hood Handicap will be the third race of the day and offer an $11,000 added purse.